Yesterday I got to play CSI, digging in potentially hazardous substances that nobody would touch voluntarily, latex gloves and all. A friend of mine (who asked to remain nameless) has had a misfortune to rent out a property of his to an unreliable tenant, and had to evict her after a number of late payments plus one skipped one. So she moved out, leaving behind an amazing mess, and my friend asked me to help him bag up and carry to the dumpster all of her stuff, so the cleaning crew could actually clean the place the next day. Here are a few items I bagged, to give you an idea of what we were dealing with: moldy loaves of bread (2), petrified mac-and-cheese in plastic container (3 tbs), bathing salts (set of 10, caked with grime), warped Velveeta cheese squares (didn't count), semi-liquefied lettuce (1 pt), and I could go on and on. We ended up with nine large garbage bags full of stuff. There were a few usable things in there too, one just had to find them and get over the general feeling of disgust with anything that used to belong to that lady. My friend did not want most of it but a few lightbulbs and some loose coins. 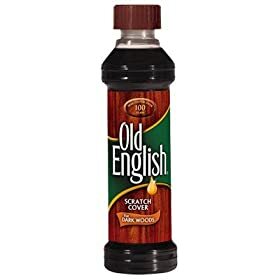 I walked away with two Pyrex dishes, square and round, a can of WD40 (unused, by the look of it), one massive cedar-wood coat hanger, a 2-liter can of unsweetened pineapple juice, and a bottle of Old English Scratch Cover for dark wood. Well, I have to tell you, this stuff is magic! In a fit of cleaning frenzy, triggered by all the mess I saw yesterday, I took an hour today to dust the furniture and mop the floors in a couple of rooms, and thought, Let's try the scratch cover thing. It is worth noting that the cabinets in my condo look far from new, and have not received much "tender loving care" in what seems to be their entire lives, so they're all scratched and water-stained, particularly the ones in the two bathrooms. ...and AFTER the application of scartch cover. Guest bathroom cabinet door partially treated. Scratch cover applied on upper right corner. Lower left is untreated. There is no ingredient list on the label, but whatever this stuff is, it's working!